Note: There are two versions of this program on the same DVD: 75-minutes and 54-minutes. "Tapped offers a provocative look at the many down-sides of bottled water--and how citizens are beginning to rise up and push back. By shining a light on threats to community water sources, risks to human health, pollution of the oceans, and mountains of plastic trash, Tapped sounds a clarion call to kick the bottle and return to the tap. And it calls on governments to fulfill their crucial role as custodians of the public trust in water." "The film leaves no stone unturned and doesn't give anyone involved--even the consumer--a free pass from their actions. From the Maine village that struggles against corporate attempts to bottle their local springwater, to the Texas town that lives with the toxic pollution from making plastic, the film takes us on a national tour of the people and communities on the front lines of environmental fights. While it would be easy to simply demonize the big corporations, the film goes further and deeper by showing how government regulation, elected representatives, and local governments have all failed us--and we have failed ourselves with our choices and addiction to disposable convenience. By showing how we have all contributed to these environmental problems, the film ends on an empowering high note, providing simple and concrete examples of how we can all be a part of the solution." "Tapped is one film that cannot be ignored. It will be a mandatory final exam for my graduate and undergraduate classes. Fresh Water Resources are an ignored reality in the USA. From this day on, the actions of ourselves and children with respect to how we bottle and utilize tap water could potentially exhaust our fresh drinking water supplies within our life time. Water is a 'free' natural resource that we take for granted. However, in due time we will learn that preservation and conservation of these valuable resources are words that should be reckoned with." "For classroom use this film is essential in that it conveys very important information, be it with an activist sense, in a way that is useful, truthful and compelling...The information presented in the film itself is vital for this youth market, since they represent an overwhelming target for the marketing of bottled water. I would recommend this film highly to any ecological, environmental or economic based topic in anthropology as well as curriculums based around chemistry. The film would also be highly applicable to high school students as well, since the entertainment value of the film provides for a considerably wider audience than found on college campuses." "Illustrates the far-reaching consequences, both local and Earth-wide, of the consumption of 'manufactured' water." "[The film] hits all sides of the issue...Convincingly argues against purchasing and drinking bottled water." "Incredibly well-balanced...Tapped is extremely well put together flowing from topic to topic without missing a beat. It provides the viewer with all sides of the story and includes interviews with professionals and citizens...This film is highly recommended for the intended audience. While this film touches numerous disciplines, libraries serving programs in environmental science, ecology, and marketing as well as public health would benefit by having this in their collections." "Assails the bottled-water industry...Viewers learn that a 'gold rush' for drinkable water is underway in the United States...Compelling." "Well researched and well argued...The film does an excellent job of connecting environmental issues and politics...Screenings of the film have inspired rallies, boycotts, and proposed bans of bottled water in cities and schools throughout the United States. Looking at these examples may inspire ideas for projects outside of class that emphasize environmental citizenship and community environment...The movie can provide a good backdrop for examining the debate between mainstream environmental sociology and ecological modernization theory over the effectiveness of reform and regulation." "Soechtig's cautionary tale is well supported by interviews with a variety of activists, environmentalists, community leaders and, especially, several small-town residents whose health and welfare have been compromised by the encroachment of the bottled water industry. If their stories don't persuade you to ditch the Dasani, vivid shots of how water bottle refuse is turning our oceans into 'plastic soup' should do the trick." "I knew bottled water was a social ill but I didn't know how damaging it was until I saw an explosive and compelling new documentary called Tapped. With style, verve and righteous anger, the film exposes the bottled water industry's role in suckering the public, harming our health, accelerating climate change, contributing to overall pollution, and increasing America's dependence on fossil fuels. All while gouging consumers with exorbitant and indefensible prices." "I'm excited about the documentary Tapped, and the trailer has got me all worked up. (The images of the plastic in the ocean make me sick.) I've had a tentative toe on the anti-plastic bus, but this film might just get me fully on board, buckled up and ready to roar." "A pretty damning look at how consumers have been tricked into spending too much money on water packaged in plastic and quite often not as clean as what's available from the faucet...Not only is it a clear waste of resources (only 20 percent of plastic water bottles used in the United States are recycled, and far too many of the rest probably end up in the Pacific Garbage Patch), it's an incredible waste of money for consumers, who pay more than the price of gasoline for water that's marketed as 'pure,' but in reality is largely unregulated, full of harmful toxins like BPA, and far less safe for drinking than free tap water. (In fact, 40 percent of the time, bottled water is nothing but municipal tap water, freed from the government oversight that keeps it safe. 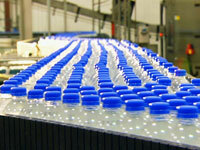 )...I will never look at bottled water with anything less than loathing from now on." "Tapped...is just as vital and maybe more important [thanFood, Inc.]...Tapped is one of the most pivotal documentaries made to save our lives." "Eye-opening, informative and incredibly important for you to see...Tapped is another example of realizing film's potential to inspire. This is a passionate documentary, well-executed from engaging and intelligent voices who will inform and entertain you with their movie. See it!" "Well-made, thought-provoking and anger-inducing...An engaging documentary that doesn't overwhelm with technical speak or annoy with tie-dye radicalism."